Todd: One of my favorite bits of Cold War paranoia are all of the stories about just how close we came to all-out nuclear war, particularly in the ‘80s, when the election of Ronald Reagan led the Soviets to believe that the Americans would begin bombing immediately. Instead, Reagan and Mikhail Gorbachev became… not friends exactly, but they certainly worked well together, and they were able to manage a somewhat peaceful decline for the Soviet Union over the course of the decade. The nuclear war that had seemed imminent for most of the Cold War period didn’t happen, and the world transitioned—sometimes painfully, sometimes easily—to the sole-superpower world of the ‘90s. In short, then, the long game The Americans is playing is about how two rival nations avoided starting World War III, when the odds were stacked against such a thing, and how that happened. At the same time, it’s about two people who have avoided seeing their marriage crumble, when the odds are stacked against such a thing. You can see where I’m going with this. “In Control” is the first episode of the show to play blatantly off of historical events, something that many TV period dramas try to avoid doing, particularly in the wake of Mad Men, which has mostly relegated the things we think of as “the ‘60s” off to the side. Now, since this is a show about Soviet spies and FBI agents in the ‘80s and it’s set in the Washington, D.C., area, the attempted assassination of Reagan by John Hinckley, Jr., couldn’t exactly pass by without comment. What’s fascinating to me is the way that the show erects an incredibly convincing false history around actual events (like Alexander Haig coming into possession of the nuclear football), then uses it to illuminate the marriage of Phillip and Elizabeth. I have some quibbles here, but I’m mostly just impressed with how good the plotting was. What about you, Libby? Make sure you drop by a complimentary pin from the Vice President’s office. Libby: It’s interesting that you mention Mad Men after watching this episode, Todd, because the show I kept coming back to while watching this episode was The Newsroom. Weird, I know, but I couldn’t help but think about how much more forgiving we are to the fictionalization of history once a certain amount of time has passed. Who decides that formula anyway? Is it five years? 10? 23? (Thanks, South Park.) 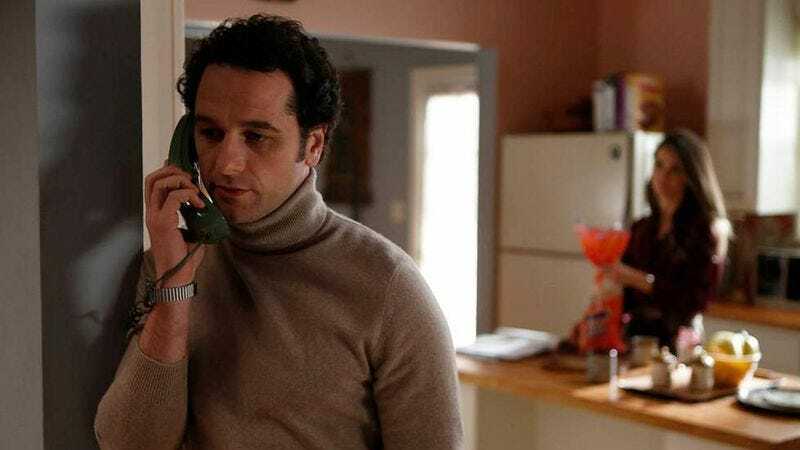 Now, obviously The Americans is far more deft with its plotting than its Coldplay-cueing counterparts, but it was still impressive to see the series treat the events with the gravity that inevitably surrounded them at the time, while still allowing for spy hijinks. To expand on what you said, though, yes, I’m always impressed with how the show is able to mirror real-world events in Phillip and Elizabeth’s marriage, but I thought the series raised the bar in this episode with the final scene between Stan and Sandra. As much as I’ve loved the dissection of the complicated relationship between the Jennings’, I’m intrigued at the thought that the show is going to take on the trials of a more traditional marriage as well. The conventional wisdom on television is that marriages are boring, and that portraying them accurately is a storytelling dead-end. That The Americans is willing to deconstruct the institution on not only one, but two fronts thrills me. But my favorite part of the episode is the snippy tone adopted by both Phillip and Elizabeth when they disagree while on the job. Did that tone sound familiar to you at all, Todd? Todd: Not at all, Libby, and I wish that just once, you’d step back from this and do things my way and see that I’m right. That final scene between Stan and Sandra was a killer for me, too, because, to expand on something I talked about last week, Stan’s time away from Sandra has caused the two to evolve ever more rapidly in different directions. As Phillip and Elizabeth are evolving toward each other (even making time for a romantic hotel tryst early in this episode), their neighbors are finding that what kills so many marriages is simple, complacent inertia. You get comfortable with a certain way of life. Then your spouse enters your bubble again after being away—whether they were off in the field with white supremacists or simply at work a lot doesn’t really matter—and you realize just how little they fit anymore into the vision of your life that you’ve constructed in their absence. The care and feeding of a relationship can be exhausting, and Stan and Sandra may be at a point where they’re simply ready to just stop trying. But I want to touch on something that’s bugging me more and more about this series: Does it bug you at all that Phillip is so clearly the person we’re supposed to sympathize with—and the person we’re clearly supposed to find to be in the “right” 95 percent of the time—and that Elizabeth is sort of made into this person who’s constantly in need of saving from her own worst impulses by him? Don’t get me wrong. I like Elizabeth a lot, and I loved when she shot that guy through the head (which, as you remarked, is essentially how you’d like to end every human interaction), but the show also seems to increasingly be going out of its way to make her the unstable, risky one, while making Phillip the calmer one who’s better at dealing with these situations. There’s an effort made to explain why Elizabeth is the way she is, and it’s early enough in the series that this could all sort itself out in due time. But it also seems to me as though the show has taken the two halves of a traditional antihero—the crazy, risky plans and the more sympathetic, domestic side—and given the former to the wife and the latter to the husband, and it’s just weird. I swear I’m not trying to win my latest Junior Feminist Badge here either. I genuinely think this is just poorly executed character development so far. You seem less concerned about this than I am, and, to completely abandon tact, you’re also a woman, and you may think I’m reading too much into things. Am I? Libby: Listen, I’ve read enough comments sections to know that they’re will be a vocal audience saying, “Duh, VanDerWerff. You ALWAYS read too much into things,” so I’ll go with the former. I don’t love the way that the writers are developing Elizabeth’s character, in no small part because in the process of seemingly subverting the typical power dynamic of rogue husband, down-to-earth wife, they’ve insisted on sticking to the more obnoxious trope of shrewish harpy wife, sensible husband. Lame. It’s not even that I don’t buy Elizabeth’s motivations; it’s just that show does such a good job of refuting them. And the bottom line is that it’s very, very difficult to make people empathize with a relatively unsympathetic character, and to this point, the series’ efforts just haven’t been good enough. I think what I absolutely need to see in the next four episodes or so is Phillip being wrong about something or making the wrong call. It’s like on Homeland, where having Carrie be too manic for too long or perpetually right about everything completely throws off the balance of the show. What The Americans needs to do is figure out its Phillip balance as well as its Elizabeth balance. Granted, it’s early in the show’s run yet, but it’s definitely something that could spiral out of control. Speaking of Phillip and Elizabeth’s early episode rendezvous, I thought that scene acted as a nice continuation of the progress made in “Gregory.” After a relationship has weathered a particularly troubled time, there can be an uncertainty, an innate newness, and the episode beautifully captured that, even sans dialogue. This was an opportunity for the series to showcase a greater softness for Elizabeth, and I think it did. But the moment was fleeting, as things quickly escalated in the world outside. But that puts me in mind of a pairing that I’m not as big of a fan of, which is that of Paige and Matthew. Todd, they aren’t going to try and Romeo and Juliet these kids, are they? And how much does that neighbor kid look like Paul Dano? So let’s leave this on some positives, all right? In general, I thought the episode really captured the feeling of what happens after a major world event has gone down, and nobody’s quite sure what’s happened. I was a baby when Reagan was shot, so I don’t specifically remember it, but the way that Jim Brady is pronounced dead by the media, then resurrected, or the way that the news stations keep showing the same footage over and over certainly rang true to the way TV still handles such crises. Furthermore, I liked how this spiraled outward into the spy storyline as well, with both Stan and the Jennings duo finding themselves unsure of how to proceed, unsure of what had even happened. It was a really smart way of pulling in almost all of the threads the show has developed so far—even Gregory gets a name check (he gets the couple a car)—and I liked the way it darted and weaved through the officially understood history. I’m also really digging the show’s low-key approach to serialization. It doesn’t call attention to the fact that little layers are carrying over from week to week. Phillip and Elizabeth’s relationship is the most heavily serialized element of the series, but little elements from each episode pop up in the episodes that follow. There was some discussion in comments last week about how maybe the body of Joyce would be where this episode picked up from, but I think we’re learning that the show doesn’t quite operate in that fashion. It seems to leave threads dangling, then picks them up again at very strange junctures, just when you probably aren’t thinking about them as a viewer. Take, for instance, Phillip’s wish to defect back in the pilot, which seemed as if the show had forgotten about it, until it comes up again tonight. That said, this brings up another little quibble of mine: I don’t think the show is particularly selling the idea that these characters would be so committed to the Communist ideal. I get that I’ve grown up in a capitalist society and, thus, will accept capitalism as the default more readily than other systems. But I would like to know what it is that ties Elizabeth so readily to the Motherland. Then again, I suspect we’ll be getting some answers about this very soon. Libby, what else did you like? Libby: One of my favorite aspects of the last two episodes, actually, has been the portrayal of both sides simultaneously working on the exact same problem. Last week, of course, it was discovering who Joyce was and what she knew. This week, that aspect came from unearthing exactly what was at the heart of Reagan’s assassination attempt and how the aftermath would unfold. Obviously, the synchronicity probably can’t last forever, but watching events unfold on either side is fascinating while it lasts. I also enjoyed the reconnaissance drop-in at the end of the episode. Any time the Jennings and Beeman couples intermingle, it’s a reliably tense time. I feel like the show isn’t going to that well too often, at least just yet, and watching the characters negotiate the situation, while never feeling entirely comfortable in the environment, is fascinating. And all the while, Sandra Beeman is completely oblivious. Todd: Absolutely. Maybe my favorite thing about the show right now is the way that it’s loading in these little grace notes around the edges of scenes. Elizabeth pretending to have been broken up about the Kennedy assassination. Phillip crouching in the woods beside his transmitter, sending coded messages to Moscow. The couple having to scramble to get out of a tight spot when they’re caught outside of the Defense Secretary’s house. (I was going to say they got out of that one a little too easily, but then I remembered how the show likes to circle back to these plot points in the weeks to come.) All of these things make the show feel lived-in, like it breathes, and that’s one of the reasons it’s become so compelling, so quickly. The things that you and I (and Genevieve) are complaining about are easy enough to fix in the weeks to come. It’s the fundamentals that have to be strong, and on this show, they very much are.